FAA’s ATADS data shows Peak Year was 2013. Total airport operations in 2014 were DOWN 2% from the peak year. Charlotte is 240-miles from the largest airport hub in the world: Atlanta, as dominated by Delta-Northwest. The Charlotte airport first emerged as a hub for Piedmont airlines, shortly after the 1978 airline deregulation. Passenger figures are said to have nearly doubled, from 1978 to 1980. Piedmont was merged into USAirways in 1989. The airport attracted service by Lufthansa in 1992, which quickly ended (then returned again in 2003). British Airways also began and eventually discontinued routes. The bulk of the commercial traffic is USAirways, as their primary hub for the southeast quadrant of the United States, with minimal competition from the other carriers. Other major airlines typically provide only minimal service, with direct routes feeding into their own major hubs. A major development was the completion of a third parallel north-south runway, which opened in 2010. 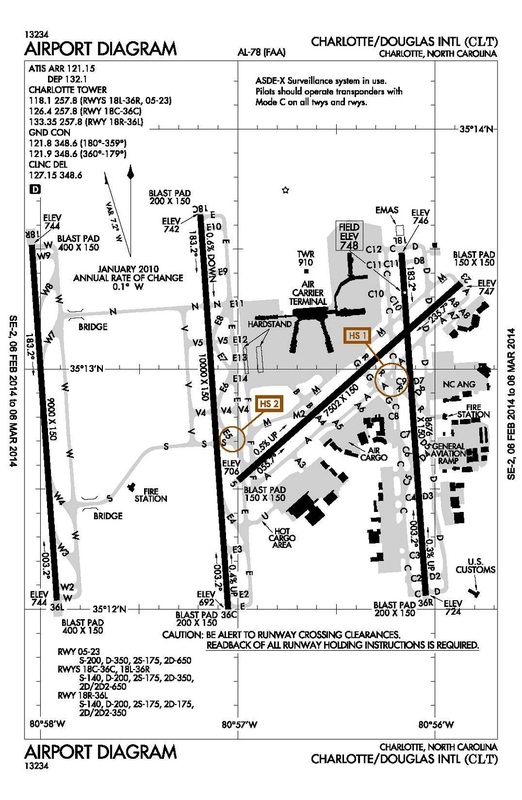 It is a mile to the west of the other runways, thus enabling multiple simultaneous traffic flows. Lawsuits have been generated.